It’s that time of year again. The next two weeks sees the arrival those fixtures of the autumn calendar: Halloween, Bonfire Night and, of course, the Manchester Coffee Festival (Cup North as was). Yes, that’s right, the Manchester Coffee Festival is back, this year on Saturday/Sunday, 4th/5th November, when it will once again grace the halls of the Victoria Warehouse in Stretford. I’ve watched the Festival evolve over the last four years. Starting out as Cup North in 2014, it was a modest, relaxed affair in a pair of adjoining rooms in Manchester’s Artwork. In 2015 it expanded to the Victoria Warehouse, occupying a rabbit warren of rooms on the first floor, feeling more like a mini London Coffee Festival, although on a much more manageable scale. Then, last year, it returned to the Victoria Warehouse, moving across the yard into a more manageable space, with a simple, figure-of-eight layout. Whether it’s your first time or you’re wondering what this year’s festival will hold, this preview is for you. With weekend tickets for just £18, or £10 if you only want to do a single day, it really is a bargain. What are you waiting for? Get your tickets now! You can find out more about the Manchester Coffee Festival after the gallery, a round-up of last year’s event. For the third year running, the Manchester Coffee Festival will be in the Victoria Warehouse in Stretford, an easy tram-ride from the city centre if you’re coming by public transport. You can expect all the usual coffee festival fare, with plenty of speciality coffee and related kit from the numerous roasters and equipment suppliers amongst the exhibitors. There’ll be food, of course, with a range of local street food traders on hand, backed up by the likes of Coffee-Spot-feeders extraordinaire, Cakesmiths. Assuming that the festival is in the same space as it was last year (which is by no means guaranteed), you will need to turn right when you go through the gates and then head past the street food village, which is outside to the right of the doors, always a bit of a gamble when you consider Manchester’s weather. Last year the street food village was a bit smaller than in previous years with Grub opening its own weekend market, pulling away some familiar faces. Last year, the festival was split over multiple, interconnected spaces, making it easy to get around between the various stands. Essentially, it occupied four sides of a large square, with the middle taken up by the toilets. Entering in the bottom-right, two rows of stands ran along the bottom of the square to your left, while on the right was a seating area for the sustainability talks. The left-hand side of the square housed another seating area, which hosted the festival’s various events. Finally, the top side of the square had another dual row of stands, with a further space beyond this, also with a dual row of stands. This layout was excellent, resulting in a very open space, with plenty of room, particularly between the rows of stands. It was also easy to move around: you could do a sweep of all the stands and seating areas in a couple of minutes, just by walking in a figure-of-eight. Even those stands tucked away in the corners or at the ends of the rows seemed to be constantly busy. This year, the usual favourites will be back: what follows is a list of my personal highlights. For a full list of exhibitors, see the festival website. Roasters have always been extremely well-represented at the festival, providing a chance to catch up old friends such as local roasters Heart & Graft and Ancoats, plus the likes of Yorkshire’s North Star (Leeds) and Bean Brothers (Huddersfield). Coming from the other direction, there’s Lancaster’s J Atkinson & Co. and, from even further afield, Cumbria’s Carvetii, plus, making a festival debut, North Berwick’s Steampunk Coffee. Talking of other directions, heading up the M5 will be Has Bean (Stafford), Clifton Coffee Roasters (Bristol), Colonna (Bath) and, from even further south, Origin and Yallah Coffee (Cornwall). London, meanwhile, is well-represented with more old friends in the shape of Allpress, Climpson & Sons, Taylor Street Roasted and Union Hand-roasted. Finally, all the way from Margate in Kent are Curve Coffee Roasters. Coffee equipment will be represented with the likes of La Cimbali, Conti and La Marzocco. Coopers will also be back with the Black Eagle espresso machine and Mythos grinders. With an eye on reusability, KeepCup returns, along with home-grown talent, Jody Leach, and his excellent Therma Cup, plus Vegware, makers of full compostable takeaway cups. Stepping back from the coffee, there will also be hot chocolate from the ever-present Kokoa Collection and tea from the nearby Brew Tea Co. Finally, the Festival will once again host a series of events, including Tamper Tantrum talks and my personal favourite, the Cup Tasters’ Championship. So, what are you waiting for? Get your tickets now! Liked this? 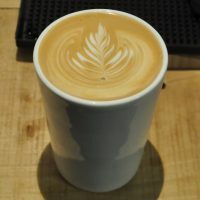 Then take a look at the rest of Manchester’s speciality coffee scene with the Coffee Spot Guide to Manchester & Salford.